1 of your 5 a day. Serves 2. No artificial colours, flavours or preservatives. Suitable for vegetarians. 1 portion = 1 of your 5 a day recommended intake of fruit and vegetables, as advised by nutritionists. 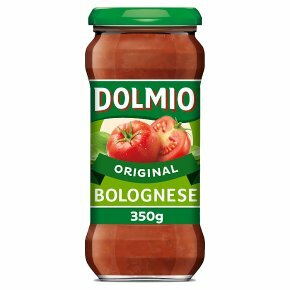 DOLMIO® Bolognese is a source of potassium. Potassium helps to maintain normal blood pressure. It's a spag bol time! Brown 200g of mince for approx. 5 mins, until cooked through. Add your DOLMIO Bolognese sauce, bring to a simmer for 5-10 mins whilst gently stirring. Serve over spaghetti or your favourite pasta and enjoy. We recommend 100g of dry pasta per person.